With beaches and coastlines all over the world already under attack from sea level rise, pollution, mining, driving, seawall construction and human development encroachment, another menace is mounting an assault. Humans are behind this one too. 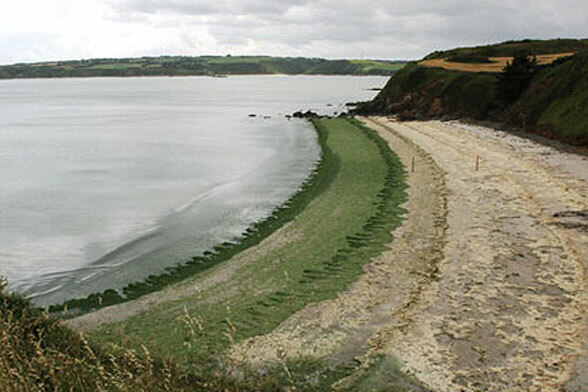 According to various media reports in France, and the United Kingdom, lethal green algae has invaded heavily used vacation beaches in Brittany, northern France and along England’s coastline from Wales to Portsmouth. Layering in deep piles, up to a meter thick with hard crusting on top, these stinking masses are ticking gas bombs. Vincent Petit, a 27-year-old veterinarian, was riding horseback on a Brittany beach near Saint-Michel-en-Greve, when his horse broke through the crust and went down. A cloud of hydrogen sulfide gas (H2S) was released from the rotting algae, reportedly killing the horse within 30 seconds. Fortunately a tractor was nearby which was used to clear away algae and drag Mr. Petit to safety. He was rescued in an unconscious state and hospitalized. Now he is suing the local municipality responsible for beach maintenance. 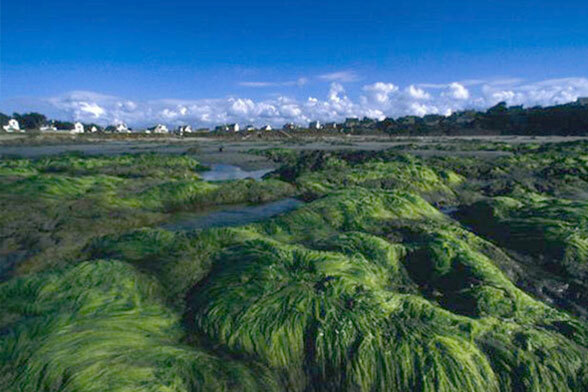 On June 22, 2009 on the Cotes d’Armor, a 48 year old maintenance worker, clearing the green algae from the beach, was stricken and died apparently from a heart attack, but in recent medical reports the lethal green algae is suspected in his death. 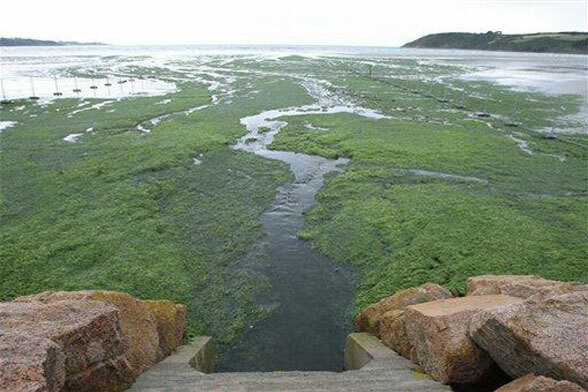 This lethal algae on the French Coast was apparently a product of over fertilization of nearby fields with drainage emptying into the ocean. 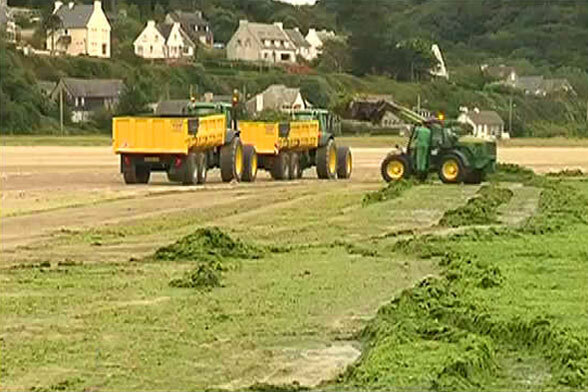 Towns along the Brittany coastline have hired bulldozers to scrape the seaweed away, but the algae keeps right on coming back. Earlier, on a beach close to where Mr.Petit’s horse died, two dogs strolling by were killed by the sulfur dioxide. In a strange coincidence indicating the global nature of this problem, the death of two dogs running on an algae encrusted beach was recently reported from north of Auckland, New Zealand, not to mention the four dogs killed in 2009 by toxic beach algae near Elkton, Oregon. The more one learns about this beach hazard, the more apparent its global scope becomes. 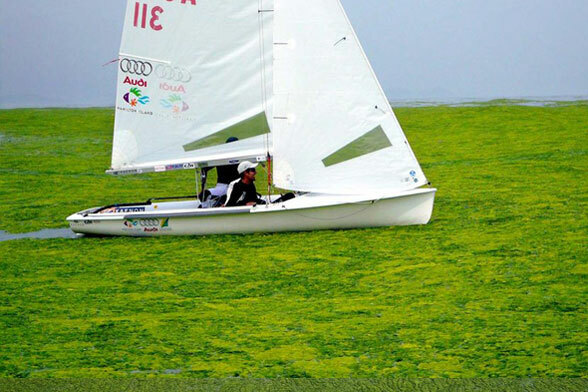 Last year, the Chinese government brought in the Army to clear away the slimy green growths so the Olympic sailing competition could be held and so observers could safely view the event. In Italy, near Genoa, a sixty year old man had to be taken to the hospital this year because he swam in algae infested water, and last year in Genoa, more than 200 people were sent to hospital after swimming in the algae or inhaling toxins carried to the beach by the wind. This summer, officials in Massachusetts put out a toxic beach algae warning but did not close the beaches. It’s a problem for fresh water lakes as well. 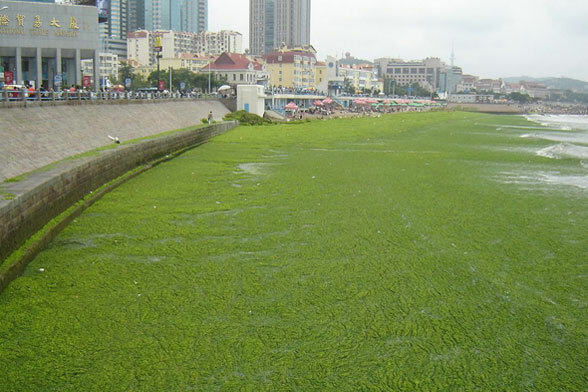 Some are attributing the algae outbreaks to global warming. Although this may indeed be a factor as our seas warm up, it is clear that excess nitrate rich fertilizers, along with animal wastes and poorly treated or untreated sewage, are the main villains. The problem is deeper than just hazards to humans. When a beach is covered with algae virtually everything that lives on and within the beach is killed while access is denied to nesting and to food for local birds, fish, sea turtles and various crustaceans. Thus, an entire beach/nearshore ecosystem that includes microscopic organisms (meiofauna) living between sand grains at the bottom of the food chain up to sharks cruising offshore, is wiped out. Simultaneously oxygen is usually depleted in nearshore waters, a threat to marine mammals and sea birds. Politicians at a high level are finally beginning to pay attention to this problem. After all, beaches are a critical part of the economy of most coastal regions. The French Prime Minister Francois Fillon, announced that the “state would take over the responsibility for cleaning the beaches most affected.” He is also creating an interdepartmental committee to fight proliferation of the green algae and to protect the population and beaches. In other countries local municipalities or health organizations are trying to cope. The problem is of course, the coastal communities themselves did not usually create the toxic situation. At fault is the agribusiness along the coast and nearby rivers using fertilizers to boost production of food. Hot weather, warm water, fertilized farms near rivers running into the sea are the problem, which disappears with the arrival of fall and winter. Unfortunately, it is always summer somewhere on our planet, and the problem flows from the land to the sea. With over 70 beaches in Northern France In trouble, as is the English coastline from Cardiff Bay to Portsmouth Harbor, coastlines worldwide are under attack. 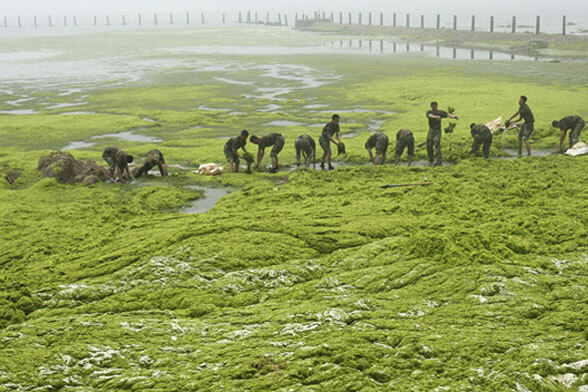 We wonder if this could be the toxic green wave of the future for developed coasts.